Be right across from the lifts in this beautiful Kirkwood 2 bedroom. It doesn't get any classier than this condo! You will be impressed with this newly remodeled Sun Meadows home. Beautifully decorated with luxury amenities such as granite counter tops, custom cabinets with island bar seating, top of the line bedding, flat-screen tv's, stone tile floors, french door refrigerator and comfortable living style. Everything in this condo has been replaced to maximize the true serene environment of the Kirkwood valley. Attention to detail shows at every decision from furnishings, luggage carts, window coverings, kitchen appliances and bed configurations. The owner's bought all new kitchen ware in 2016 so you will be cooking in not only a new kitchen but new utensils too! This is a 2 bedroom condo each having their own bath and two queen beds. This would be best for two small families or one large one. The living room has a queen sofa bed with an adjoining bedroom while the other bedroom can lock off to create a separate "hotel style" bedroom. This lock off bedroom is complete with it's own small refrigerator, microwave, coffee pot/grill/toaster unit. 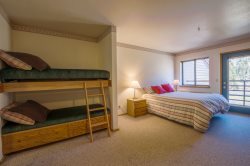 This Sun Meadows condo is almost ski-in ski-out because it is right across the street closest to the Lodge so you can walk right out of your condo building and be right in the center of everything. You can be skiing in less than 3 minutes when you stay here. It's easy to come home at lunch or after a long day of skiing. What is nice about not being right on the mountain, is it's a little quieter and more private in case you have family that doesn't ski but wants to join you for the trip to Kirkwood. "As a cook, I enjoyed this condo because the kitchen was fully stocked. My kids loved it because it was so close to the lifts, I didn't have to accompany them!" We provide the following amenities: dining table seating for 6, bar seating for 2, dishwasher, electric stove, microwave, coffee maker, basic pots and pans, brand new dishes and silverware. - The lock off room has it's own small refrigerator, microwave, coffee/grill/toaster unit. One marked parking space in garage. Very convenient location, right next to the ski lift area. Nicely maintained inside and out side. General store is quite empty. MANAGER RESPONSE: It is always recommended visitors stop at a grocery store prior to getting to Kirkwood as restaurants and food is limited. We needed to cancel and re rent or downsize the reservation because one of our children was sick and could not travel. Nicole helped us rent out part of the unit to make it more economical for the other 2 of us to come. Thank you!